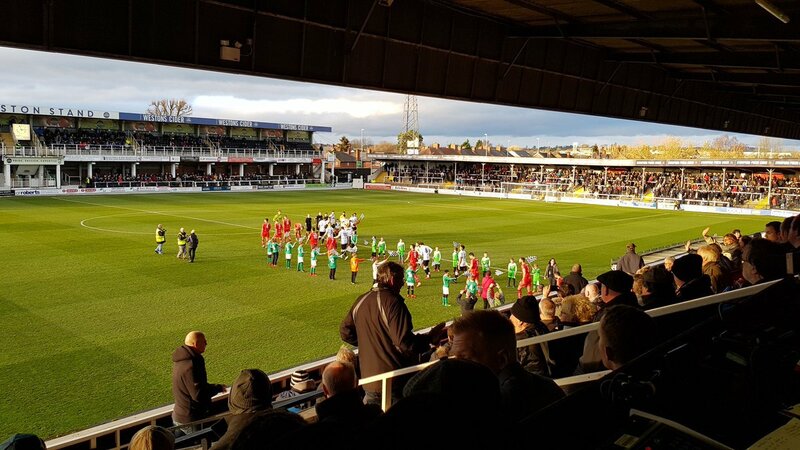 Alfreton Town's poor form in the National League North continued on Saturday afternoon, as a 90th minute penalty snatched away a point for the Reds, in an ultimately deserved win for Hereford at Edgar Street. Billy Heath made five changes, Adam Curry came in for his debut in defence with Tom Platt, Josh Clackstone, David Lynch and Richard Peniket all starting with Callum Chettle and Reece Styche on the bench. With a buzzing atmosphere greeting the two sets of players inside the ground, the game started at a quiet pace as both sides struggled to maintain possession and in turn create early openings. A early free kick saw Finn glance a header towards Sam Ramsbottom but the offside flag went up as Ramsbottom spilled the effort. Nathan Hotte hammered an effort over the bar from a Peniket lay off before James Clifton swung a corner in only for it to be blocked before a sharp drop of the shoulder from Clifton and cross earned the Reds another corner which was also cleared. Ramsbottom was then booked for clattering into Thomas on the right touchline with a mistimed interception before the Bulls took the lead on 18 minutes. Finn was found on the left side of the box after a pass took Hotte and Clackstone out of position, Finn's cross was parried by Ramsbottom but the ball fell to Symons a yard out and he finished to send the home crowd wild. It was a horrible set back for the Reds who had started the game reasonably well. Owen Evans tested Sam again but a fantastic palming save prevented the top corner effort. We pushed again and earned several corners but Hereford defended well. Evans came close again for Hereford as his effort smashed against the bar and bounced on the line before Lloyd hit the post from the acute angle. Alfreton who started the game fairly well struggled to create openings once again in the first half with our attack lacking bite and the hosts went into the break deservedly ahead. The second half had stark similarities to the first with the game starting at a slow pace, a few tough challenges came in from Dinsley and Lynch before Ramsbottom held a free kick well before Liburd headed a corner wide. Alfreton's first opening came after a neat move but the attack broke down as Peniket raced into the box but opted to leave the loose ball for substitute Craig Hobson instead of shooting himself, Hereford cleared away to add to the frustration in the ranks. Handbags ensued moments later after Clifton went down holding his face after an aggressive reaction from the Bulls to Clifton's initial penalty claim, Peniket and Smith were booked for their involvement. Adam Curry was having a fantastic game and his crucial tackle and header away from a corner at least gave one positive in the game. The Bulls nearly made it two with a cross from the left which just eluded Symons at the back post before Alfreton stunned Edgar Street to level the game on 87 minutes. Reece Styche's cross was gorgeous and floated onto Hobson who powered the header home unmarked to give the Reds what looked like an unlikely point. However in stoppage time, Alfreton conceded a penalty after a Bulls player was brought down and James Roberts stepped up and converted to send the home fans crazy and hand the Reds yet another sucker punch this season and yet another defeat in a desperately poor run of form in the league. Next up, we dust ourselves down and go again as we head to Ashton United tomorrow night looking for three points to revitalise the confidence and the season. ATFCXI: Ramsbottom, Clackstone (Styche 77), Allan, Lynch, Riley (c), Curry, Clifton, Hotte (Hobson 57), Peniket, Platt, Bateson (Chettle 61). Subs Not Used: Nicholson, Clarke.